RTG's Aces And Eights is A Twist On Their Four Of A Kind Payout! When looking for online video Poker games one of the reliable gaming software developers one can put their trust in is Real Time Gaming. Offering many variants of these popular Poker games, here's a look at Aces & Eights and how it may differ to other online games. All different variants of Poker have some slight little twists, often evolving around the Pay Table, Aces & Eights is no exception, however where some games like Jacks and Better offers 9 different ways to win with this game there are 11. The title of the game specifically relates to making up a four of a kind winning combination exclusively of Aces or Eights out of the cards dealt. This however is not at the sacrifice of the Four of a Kind winning pay out. 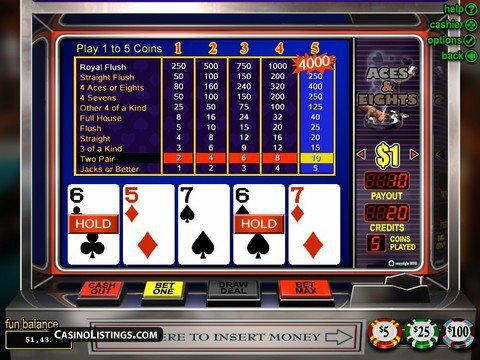 The Four of a Kind winning hand pays out less than what would normally be expected roughly half, but the Aces & Eights pays one and a half times more than say with Jacks and Better. With the addition of a Four Sevens payout, this looks like a really worthwhile game to play as this hand pays two thirds more than the Four of a Kind on Jacks or Better, so it's really a case of deciding whether this is a good trade off to make. Not to forget when the player hits one of the winning hands on the pay table, he can choose to play 'Double or Nothing' to increase his winnings, although strategy wise, he might feel that it would be best to save that option on the smaller payouts, where the potential winnings being gambled, aren't so great. This is an easy game to play and easy to get the knack of how it works, a player's up and running instantly. Ready to try out RTG's Aces & Eights? Try it free today at WinPalace Casino!